Hi friend! I hope you’ve had a splendid week! 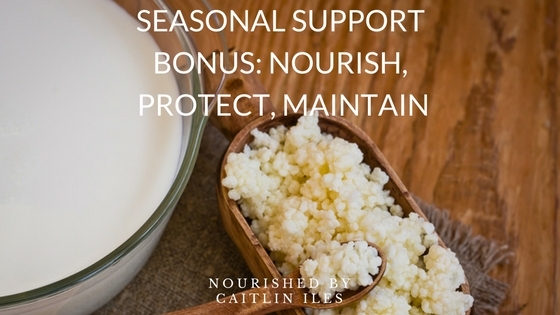 Today I’m sharing a little bonus article to go with the Seasonal Support Series I’ve been working on. We already talked about certain immune boosting foods, liver supporting herbs, and the importance of rest for keeping our immunity high. Today I wanted to share something that may seem a little off base, but which is totally necessary for optimal health and immune function: your digestive tract! I’ve talk a bit about leaky gut in the past so you are probably aware that a healthy digestive system is the foundation of vibrant health because up to 70% of our immune system resides in your gut. Lucky for you, one of the best weapons you have at your disposal is a diet rich in foods that nourish, protect, and maintain your digestive health. Try incorporating at least one food from each of the groups below into your daily diet so you can build your healthiest body. Bone broth has been a traditional dietary staple for centuries thanks to its easily absorbed minerals and healing nutrients, making it an ideal food for you if you have a damaged tummy. While there is not a huge amount of scientific data on the benefits or nutritional profile of bone broth, most are a great source of nutrients such a collagen, gelatin, proline, glycine, and glutamine, all of which work synergistically to heal tissues, mitigate damage from free radicals, and reduce joint pain. Bone broth has also been shown to inhibit inflammation in chest colds, which can help you feel better, faster. So trust in the wisdom of your ancestors and incorporate broth into your daily diet. It works great as a base for soups, stews, and sauces, or you can simply drink it by the mug full. Bonus: Add healing spices such as turmeric and cayenne for an extra punch. Here’s a great recipe for making your own. Remember to always use bones from humanely raised animals, as their diets will affect the nutrient content of the bones. Plus it’s important to support the people who are caring for our planet and the animals on it in a sustainable and ethical way. If you are living a plant-based life, my friend and fellow Culinary Nutrition Expert Alum, Juliette LaCroix, created this herbaciously healing broth. Studies have shown that a healthy balance of gut bacteria is crucial to a maintain a properly functioning immune system and prevent autoimmune conditions. Like bone broth, fermented foods, which are a great source of probiotics, have been an important part of traditional diets for centuries. Lucky for you, it’s easy and affordable to make your own fermented foods such as sauerkraut, kombucha, kefir, yogurts, lacto-fermented veggies, and vinegars. If you’re buying these foods make sure they are unpasteurized and made with the highest quality ingredients. You can even download my FREE Fermentation E-Book right here! Try adding kefir or yogurt to smoothies, sauerkraut to salads, apple cider vinegar to dressings, and sipping on kombucha to get your daily fix. Now that you’ve populated your digestive tract with healthy bacteria, you have to make sure they’re getting enough of the foods they need to thrive. Most probiotics feed off specific kinds of fibre called fructo-oligosaccharides (FOS) and inulin. I’ve found it’s best to go right to the source and get these fibres from nourishing foods such as leeks, onions, garlic, Jerusalem artichokes (my FAVE veggie. Try making chips, fries, and purees out of this delightful treat), asparagus, chicory, dandelion greens, and bananas. Add bananas to your smoothies, make delicious mashed Jerusalem artichokes instead of potatoes, use dandelion greens as the base for salads, and drink chicory root “coffee” to reap the benefits. Well those are some of my favourite foods that cover all your bases in terms of providing your body with the nutrients needed to nourish, protect, and maintain a healthy digestive tract. Another key ingredient in gut health is eliminating foods that may be causing irritation, sensitivities, allergies, or localized inflammation. If you need some help figuring that stuff out, then make sure you check out the details of my Reset Yourself Nutrition Challenge, which Ill be running again from January 15th to February 12th. There’s already a great crew ready to rock and we’d love to have you join! You can check out all the details here!